Fredericks & Freiser is pleased to announce an exhibition of new work by Douglas Kolk. 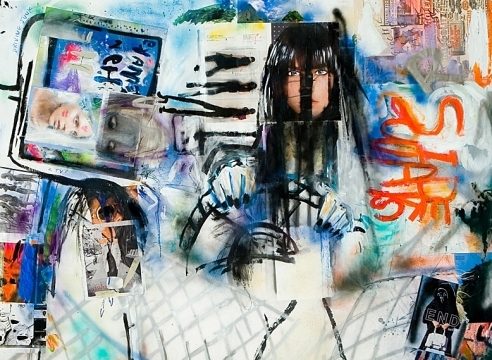 This will be the artist's first solo exhibition in New York since 1997. The show will include eight large-scale works on paper. Kolk makes dense compositions that are dark and poignant. Whereas his early drawings depict the fragility of his young and mournfully afflicted characters with a spare and startlingly abrupt line, his recent painting/drawing/collage works display a horror vacui of unrestricted gesture. Here KolkÍs particularly nightmarish vision is rendered uncooked. clippings with delicate sketches and bold painterly abstraction, Kolk contrives an alluring arena between reality and distortion. His work entrances with confessional intimacy, disclosing compulsive beauty in the hollow and salacious. Douglas Kolk (born 1963, Newark, NJ) grew up near a nursing home headed by his father, a Baptist preacher. In the mid-90's he had solo exhibitions at David Zwirner, New York; and Stephen Friedman Gallery, London. He ceased his artistic work in 1999 as a result of excessive drug consumption and started working again only in 2004. Since then he has been included in group shows at Kunsthalle Manheim; galerie du jour agnès b., Paris; and The Royal Academy of Arts, London. He has had solo shows with Arndt & Partner, Berlin and Zurich (who began showing his work in 1994) and the Kunstlerverein Malkasten, Dusseldorf. He is included in the permanent collection of the Museum of Modern Art, New York and is the subject of a self-titled monograph published by Hatje Cantz. This is his first solo exhibition at Fredericks & Freiser.